Google Reader is one of the best tools for RSS consumption, while it works great without hiccups even if you through hundreds of feeds into it, it sometimes gets boring with all the text interface. 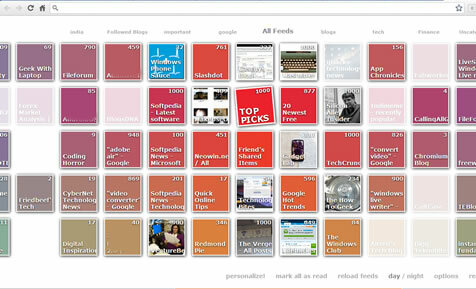 FeedSquares is a Chrome extension that gives a refreshing look to Google Reader. 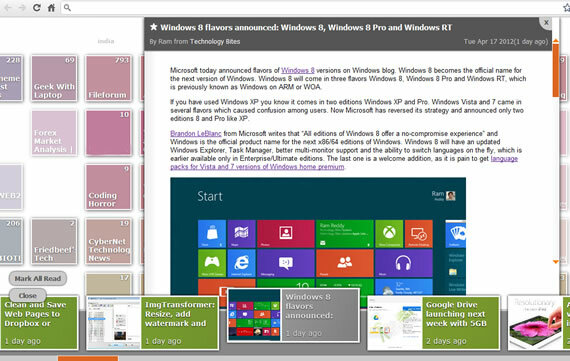 FeedSquares arranges news feeds that are added to your Google Reader in squares in a visually appealing interface. You need to sing-in to Google Reader for the app to work. The Feed Squares are colored with different colors and arranged all over the screen to give a refreshing look. Use mouse scroll or scrollbar at the bottom to navigate the entire feed collection. Clicking on a square will reveal the individual feed items at the bottom of the browser with images highlighted along with text. Use mouse scroll to navigate the individual items and clicking on them will open the feed item in a overlay on top of the feed squares. All your folders associated with feeds are displayed on top as labels. At the bottom you will find options to personalize the view, you can hide all read feeds, reload feeds and more. If you prefer a darker background you can select that using night theme at the bottom. Using the options you can change the feed update interval, and update other settings. FeedSquares is a nifty extension that adds a nice interface to Google Reader. Download here.